Jaya One is only 15 minutes away from major highways like, LDP, Sprint, Kerinchi, and Federal. It is accessible by public transport and we have ample parking at reasonable rates. Jaya One is just 30 minutes drive from KL City Centre or Subang Jaya. If you’re taking a taxi, do remind the taxi driver to use the meter. Need a taxi to go home? Just approach our Information Counter at B2, near Guardian for assistance. Our 2,400 parking bays are conveniently divided into different coloured zones for easy identification of the zone you will be going to. If you are going to Cold Storage parking at B2 would be the most convenient. 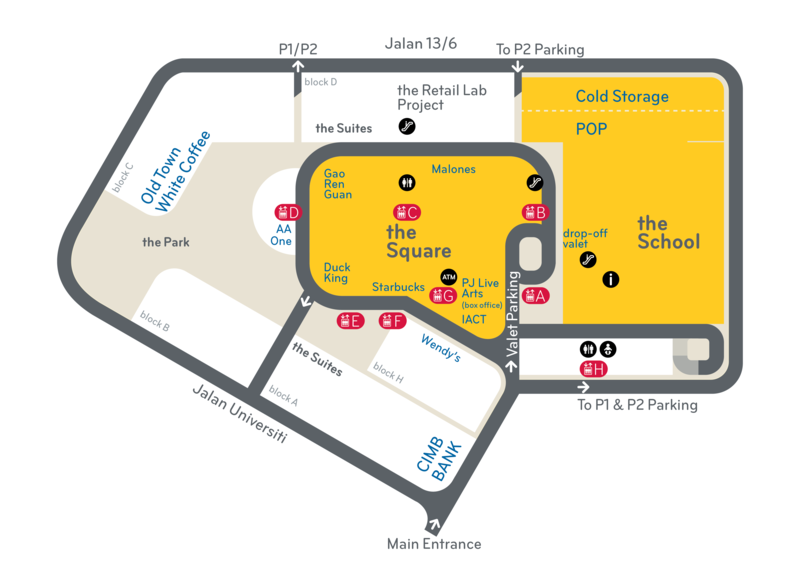 If you are going to the Square, parking at B1 or B2 near Block J will be the most convenient, or you can valet park your car at the Ground Floor. We have 2 sides to enter our parking, Main Entrance via Jalan Universiti (by side of Diethelm) and 2nd Entrance via Jalan 13/6 (in front of UTAR). Here’s a map to show you how.